Neuroscience is a composite of several disciplines including neuroanatomy, neurophysiology, neurology, neuropathology, neuropharmacology, behavioral sciences, and cell biology. An overview of the structural organization of the nervous system is helpful when beginning to study the neurosciences. However, first it would be useful to define some basic terms that will be essential for understanding the anatomy of the nervous system. The spatial relationships of the brain and spinal cord usually are described by one or more of five paired terms: medial-lateral, anterior-posterior, rostral-caudal, dorsal-ventral, and superior-inferior (Fig. 1-1). Medial-lateral: Medial means toward the median plane, and lateral means away from the median plane. Anterior-posterior: Above the midbrain, anterior means toward the front of the brain, and posterior means toward the back of the brain. At and below the midbrain, anterior means toward the ventral surface of the body, and posterior means toward the dorsal surface of the body. 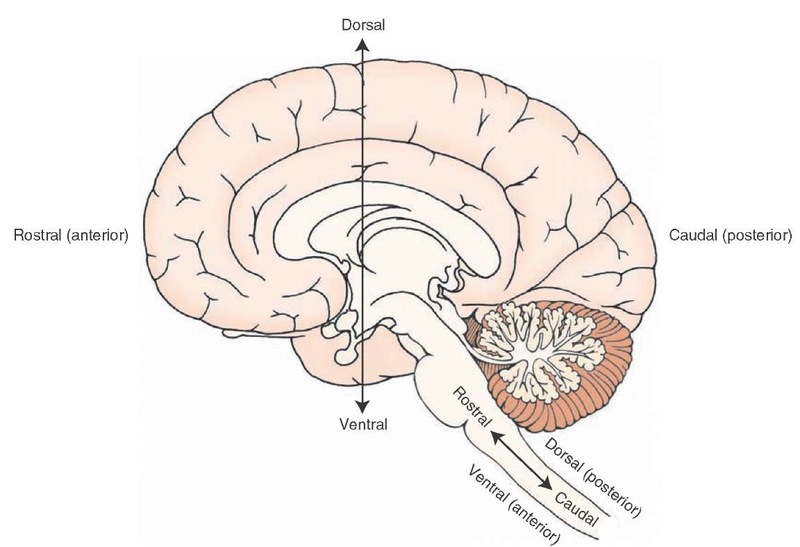 Rostral-caudal: Above the midbrain, rostral means toward the front of the brain, and caudal means toward the back of the brain. At and below the midbrain, rostral means toward the cerebral cortex, and caudal means toward the sacral end (or bottom) of the spinal cord. Dorsal-ventral: Rostral to the midbrain, dorsal refers to the top of the brain, and ventral refers to the bottom of the brain. At the level of and caudal to the midbrain, dorsal means toward the posterior surface of the body, and ventral refers to the anterior surface of the body. Superior-inferior: Both at positions above and below the midbrain, superior means toward the top of the cerebral cortex, and inferior means toward the bottom of the spinal cord. Ipsilateral-contralateral: Ipsilateral means on the same side with reference to a specific point; contralateral means on the opposite side. Commissure and decussation: Commissure is a group of nerve fibers connecting one side of the brain with the other. Decussation is the crossing over of these nerve fibers. Neuron: A neuron is the anatomical and functional unit of the nervous system, which consists of a nerve cell body, dendrites (which receive signals from other neurons), and an axon (which transmits the signal to another neuron). Nucleus: Nucleus refers to groups of neurons located in a specific region of the brain or spinal cord that generally have a similar appearance, receive information from similar sources, project their axons to similar targets, and share similar functions. Tract: Many axons grouped together, which typically pass from a given nucleus to a common target region or to several regions, form a tract. White and gray matter: When examining the brain or spinal cord with the unaided eye, one can distinguish white and gray tissue. The region that appears white is called white matter, and the area that appears gray is called gray matter. The appearance of the white matter is due to the large number of myelinated axons (largely lipid membranes that wrap around the axons) that are present in this region. FIGURE 1-1 A variety of terms are used to indicate directionality within the central nervous system (CNS). The fixed axes for anatomical reference planes are superior-inferior and anterior-posterior. The other axes vary according to their location within the CNS. In contrast, the gray matter consists mainly of neuronal cell bodies (nuclei) and lacks myelinated axons. Glial cells: These nonneural cells form the interstitial tissue of the nervous system. There are different types of glial cells, which include astrocytes, oligodendrocytes, microglia, and ependymal cells.Central and peripheral nervous systems: The central nervous system (CNS) includes the brain and spinal cord and is surrounded and protected by three connective tissue coverings called meninges. Within the CNS are fluid-filled spaces called ventricles. The bone of the skull and vertebral column surround the brain and spinal cord, respectively. The peripheral nervous system (PNS) consists of spinal and cranial nerves that are present outside the CNS. Autonomic and somatic nervous systems: These are functional subdivisions of the nervous system (in contrast to the anatomical classifications described earlier). Both of these divisions are present in the CNS and PNS. The autonomic nervous system innervates smooth muscle and glands, whereas the somatic nervous system innervates mainly musculoskeletal structures and the sense organs of skin. To understand the function of CNS structures, it is important to be able to identify and locate them in relation to one another. The many structures of the brain and spine may seem confusing in this initial overview, but knowing what they are is essential for developing a broader familiarity with neuroscience. It will not be necessary to memorize every structure and function in this introduction because the topics that follow present these structures in greater detail. We will begin with an examination of the major structures of the CNS, taking a topographical approach to the review of anatomical and functional relationships of structures in the cerebral cortex. Key structures will be identified as they appear in different views of the brain. As we just indicated, the study of the CNS includes both the brain and spinal cord. This topic provides an initial overview of these regions. The spinal cord is a thin, cylinder-like structure with five regions that extend from its attachment to the brain downward. The most rostral region, which is closest to the brain, is the cervical cord and contains eight pairs of spinal nerves. Caudal to the cervical cord lies the thoracic cord, which contains 12 pairs of spinal nerves. Next is the lumbar cord, which contains five pairs of spinal nerves. The most caudal region, called the sacral cord, contains five pairs of spinal nerves; the caudal end of the spinal cord is called the coccygeal region and contains one pair of spinal nerves. In the cervical and lumbar regions, the spinal cord is enlarged because of the presence of greater numbers of nerve cell bodies and fiber tracts, which innervate the upper and lower limbs, respectively. The brainstem, cerebellum, and cerebral hemispheres form the brain. The brainstem can be divided into three regions: the medulla, rostral to and continuous with the spinal cord; the pons, rostral to the medulla; and the mid-brain, rostral to the pons and continuous with the dien-cephalon. The cerebellum is positioned like a tent dorsal to the pons and is attached to the brainstem by three massive fiber groups, or peduncles. The cerebral hemispheres contain the cerebral cortex, which covers the surface of the brain and is several millimeters thick as well as deeper structures, including the corpus callosum, diencephalon, basal ganglia, limbic structures, and the internal capsule. One important aspect of the anatomical and functional organization of the CNS should be remembered throughout the study of neuroscience: For most sensory and motor functions, the left side of the brain functionally corresponds with the right side of the body. Thus, sensation from the left side of the body is consciously appreciated on the right side of the cerebral cortex. Similarly, motor control over the right arm and leg is controlled by neurons located on the left cerebral cortex. Four lobes of the cerebral cortex—the frontal, parietal, and temporal lobes and a portion of the occipital lobe— can be identified on the lateral surface of the brain (Fig. 1-2). The lobes of the cerebral cortex integrate motor, sensory, autonomic, and intellectual processes and are organized along functional lines. For the most part, a fissure, called a sulcus, separates these lobes. In addition, pairs of sulci form the boundaries of ridges referred to as gyri. The cortex consists of both cells and nerve fibers. The cellular components constitute the gray matter of cortex and lie superficial (i.e., toward the surface of the cortex) to the nerve fibers. As a general rule, the nerve fibers that comprise the white matter of the cortex pass between different regions of cortex, facilitating communication between the lobes of the cerebral cortex. In addition, large components of the white matter consist of fibers passing bidirec-tionally between the cortex and other regions of the CNS. The first step in identifying the main structures of the lateral surface of the brain is to locate the central sulcus, which serves as the posterior boundary of the frontal lobe (Fig. 1-2). This sulcus extends from near the longitudinal fissure (present along the midline but not visible in the lateral view of the brain shown in Fig. 1-2) ventrally almost to the lateral cerebral sulcus (Sylvian sulcus). The frontal lobe, the largest of the cerebral lobes, extends from the central sulcus to the frontal pole of the brain. It extends inferiorly to the lateral sulcus. The frontal cortex also extends onto the medial surface of the brain, where it borders the corpus callosum inferiorly (see Fig. 1-3). FIGURE 1-2 Lateral view of the cerebral cortex showing the principal gyri and sulci. Major structures include the central sulcus and the precentral (primary motor), premotor, and postcentral (primary somatosensory) gyri. Also note the gyri situated rostral to the premotor cortex, including the orbital gyri, which mediate higher order intellectual functions and contribute to the regulation of emotional behavior. Broca’s motor speech area and Wernicke’s area (for reception of speech) are important areas associated with speech. 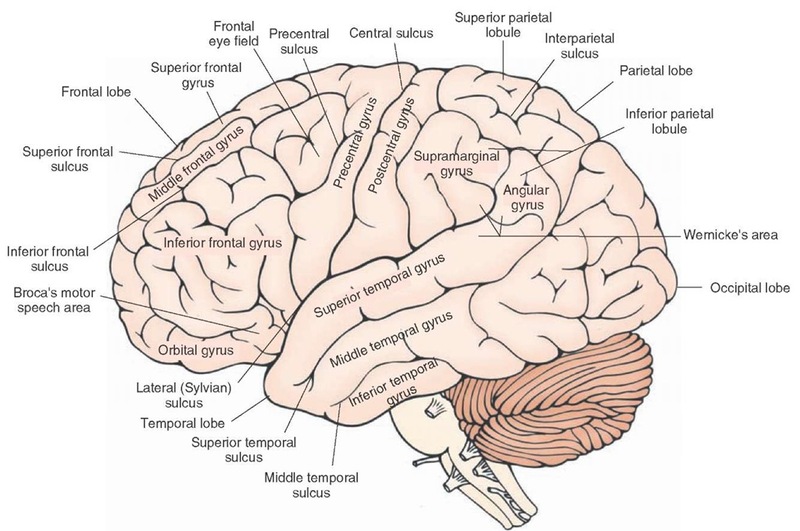 Of the three gyri comprising the temporal lobe, the superior temporal gyrus is important for auditory functions, and the inferior and middle temporal gyri mediate complex visual functions. Different aspects of the parietal lobe located just caudal to the primary somatosensory cortex integrate a variety of higher order sensory functions; the occipital lobe contains the primary receiving area for visual impulses. At the posterior aspect of the frontal lobe, the most prominent structure is the precentral gyrus, which is bounded posteriorly and anteriorly by the central and pre-central sulci, respectively (Fig. 1-2). The function of the precentral gyrus is to integrate motor function signals from different regions of the brain. It serves as the primary motor cortex for control of contralateral voluntary movements. The neurons within the precentral gyrus are somatotopi-cally organized. Somatotopic means that different parts of the precentral gyrus are associated with distinct parts of the body, both functionally and anatomically. The outputs from the precentral gyrus to the brainstem and contralateral spinal cord follow a similar functional arrangement. The region closest to the lateral (Sylvian) sulcus (the inferior part of the precentral gyrus) is associated with voluntary control over movements of the face and head. The neurons associated with motor control of the upper and lower limbs are found at progressively more dorsal and medial levels, respectively. The motor neurons associated with control over the lower limbs extend onto the medial surface of the hemisphere. When the parts of the body are drawn in terms of the degree of their cortical representation (i.e., in the form of a somato-topic arrangement), the resulting rather disproportionate figure is commonly called a homunculus.The motor homunculus demonstrates how cell groups in the CNS associated with one part of the body relate anatomically to other cell groups associated with other parts of the body. In addition, the illustrative device shows the relative sizes of the populations of neurons associated with specific parts of the body. Immediately rostral to the precentral gyrus is the pre-motor area (premotor cortex), which extends from near the lateral fissure on to the medial surface of the brain; this region is referred to as the supplemental motor area. This cortex exercises control over movements associated with the contralateral side of the body by playing an important role in the initiation and sequencing of movements. Immediately anterior to the premotor cortex, three parallel gyri—the superior, middle, and inferior frontal gyri—are oriented in anterior-posterior positions (Fig. 1-2). In the region of the middle frontal gyrus extending into the inferior frontal gyrus and immediately rostral to the premotor region, lies an area called the frontal eye fields. This region coordinates voluntary control of conjugate (i.e., horizontal) movement of the eyes. FIGURE 1-3 Midsagittal view of the brain. Visible are the structures situated on the medial aspect of the cortex as well as subcortical areas, which include the corpus callosum, septum pellucidum, fornix, diencephalon, and brainstem structures. Portions of these gyri are also involved in the integration of motor processes. For example, one part of the inferior frontal gyrus of the dominant (left) hemisphere is Broca’s motor speech area and is important for the formulation of the motor components of speech. When damaged, the result is Broca’s aphasia (or motor aphasia), a form of language impairment in which the patient has difficulty in naming objects and repeating words, while comprehension remains intact. Far rostral to this region, an area that includes inferior (orbital gyri), medial, and lateral aspects of the frontal lobe, called the prefrontal cortex, also plays important roles in the processing of intellectual and emotional events. 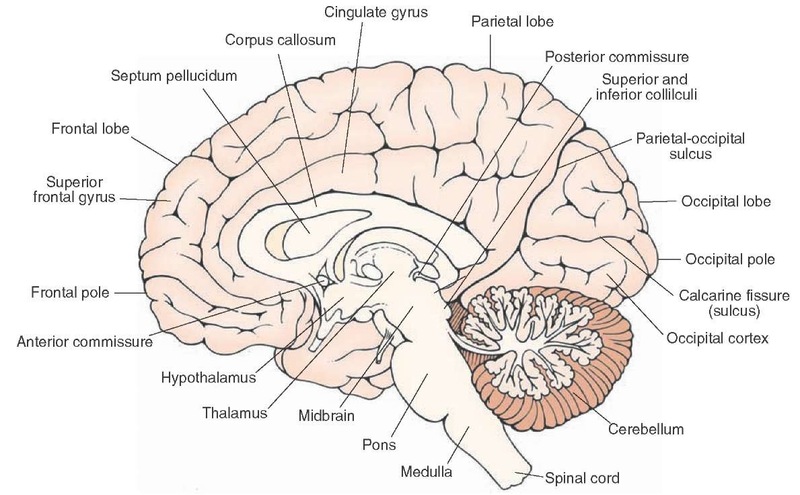 Within the depths of the lateral (Sylvian) sulcus is a region of cortex called the insula, which can be seen only when the temporal lobe is pulled away from the rest of the cortex. It reflects a convergence of the temporal, parietal, and frontal cortices and has, at different times, been associated with the reception and integration of taste sensation, reception of viscerosensations, processing of pain sensations, and vestibular functions.